It seems like it is about time for our travels to lead us back to Nomad Lounge. Last time we wandered through here we look at some of the sweeter offerings, but today we’re on the hunt for something with a bit more substance to it. A pair of sandwich-type offerings should do the trick, so let’s sample the lounge’s Africa-Spiced Wagyu Beef Sliders and Florida Lionfish Tacos. 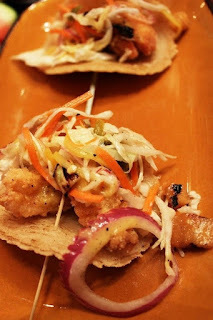 The Florida Lionfish Tacos are listed as coming with charred pineapple and jalapeno, but each of the tacos is also topped with a vinegar slaw. Being in Central Florida provides the opportunity to utilize a wide variety of fish, including the lionfish. In fact, you might not have had lionfish before. It is native to the South Pacific and Indian Ocean, but has begun taking over and killing off native species in the Atlantic. As part of the move to cut down the number of invasive lionfish is a campaign to create a human appetite for the fish, which is why you may see t pop up on more and more in the area. It is a very versatile fish in terms of preparation, and the light breading and frying done at Nomad Lounge allows for the delicate texture of the fish to shine through. The Florida Lionfish Tacos are more of a tostada than a taco, as the tortilla isn’t very pliable, and are almost too small for the amount of ingredients they were meant to contain. The slaw is vinegar based, and doesn’t stand out as anything other than what it is, but it was a nice addition to the dish. The sweet flavor of the charred pineapple makes my mouth water, while the jalapenos give the dish an excellent kick. Overall, this was probably my least favorite of the small plate offerings from Nomad Lounge, but it is far superior to entire menus elsewhere. I’m more inclined to grilled fish tacos, so that may be part of it, because this seems like a great concept that just needs a little more thought behind it’s execution. 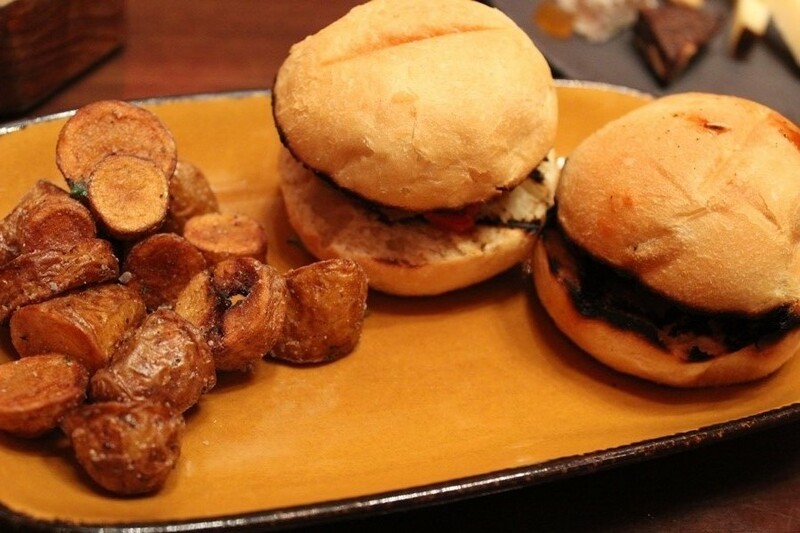 Let’s move on over to the Africa-Spiced Wagyu Beef Sliders and their accompanying vinegared potatoes. We sampled everything dish at Nomad Lounge, but the vinegared potatoes may have stolen the show away from all the other small plates. The roasted potatoes are crispy on the outside, with tender flesh just beneath the surface, even though they are relatively small. The potatoes are tossed in vinegar prior to roasting and absorb all of those wonderfully tart flavors. To finish of this side dish, salt is added. Think of these as the best salt and vinegar potato chips you’ve ever tried. Our main component here, however, are the sliders themselves. The buns have been toasted to hold the contents together. What contents, you ask? I’m happy to tell you that there isn’t much here, and that is a very good thing. On the buns are only two components, a sweet and spicy tomato jam and the wagyu patty itself. Wagyu is the current must-have name given to high end beef that comes from certain areas of Japan, also Australia, the United States, Canada, and the UK, but mostly Japan. Wagyu is delicious, especially when seasoned correctly, as is the case with Nomad Lounge. There is a richness to the meat that comes through and is highlighted with the jam that is firing on all cylinders. There are a lot of great menu items at Nomad Lounge to sink your teeth into, and the African-Spiced Wagyu Beef Sliders are definitely in the upper echelons of those dishes. As seems to be the case with every visit we have to Nomad Lounge, the complaints are few and far between, bordering on nit-picking, while the joys and happy food dances are copious. If you’re a fan of fish tacos, particularly of the fried variety, give the Florida Lionfish Tacos a whirl. As for the Africa-Spiced Wagyu Beef Sliders, I can’t recommend them enough. The only sadness that’s going to come into your life at in this lounge is when the small plates and your glass is empty, luckily they know the cure for both at Nomad Lounge. I'm trying to remember if I've had the sliders. Since discovering the ribs, everything else is just a vague memory.